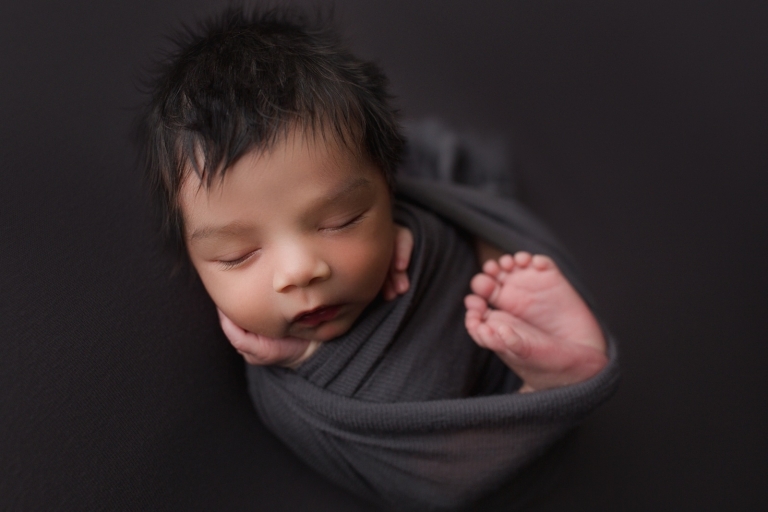 He was one of THE best babies I had in the studio for a newborn session! As soon as I saw him in his carseat, I did a little happy dance inside! Seeing all of his hair and those chubby cheeks made me so excited for this baby to be photographed! I was swooning the entire time during his photography session! And he was tiny as could be, so he snuggled right into every pose! It was an honor to be his Puyallup newborn photographer! The way his hands fit right around his cheek and the way his little feet met together … I just love all of the little baby features on these newborns! 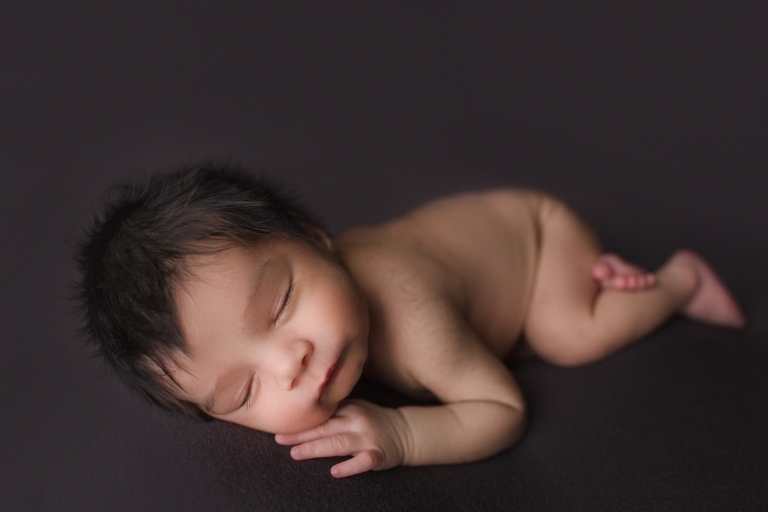 It’s why its SO important to have these little ones photographed during their first 2 weeks of life! They are still sleepy and posable and make for the best posing for photos! The colors mom chose were perfect for his skin color too! Gray and cream are my favorite colors with boys! And not to mention…showcased that amazing head of hair! I just can’t get over how great it is! I felt like it was a crime to even put a bonnet on him! The bonnet I did put on him is from Nohealani Knits and she’s local to Washington state! I love supporting small businesses and she’s one of the best! And the parents … wow! They were stunning! Especially mom! She’s absolutely gorgeous! This post is long, but I couldn’t leave any photos out of this session because I loved every one of them!